This article is about the Event in the Nintendo 3DS version of Mario & Sonic at the Rio 2016 Olympic Games. For other uses of the term "Long Jump", see Long Jump (disambiguation). Info Speed up and jump right at the line! Do a Super Dash for more distance! Run up and jump from the takeoff board. Compete to jump the farthest. 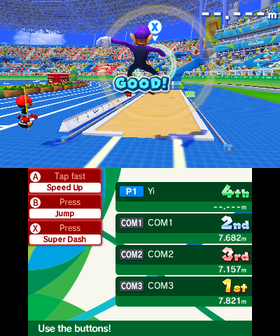 Long Jump is an Event that appears in the Nintendo 3DS version of Mario & Sonic at the Rio 2016 Olympic Games. The objective of the event is to reach the furthest distance possible using a single jump, with the starting world record being 8.95m and the starting Olympic record being 8.90m.The playable characters in this event are Mario, Waluigi, Bowser Jr., Sonic, Espio, Eggman Nega and Mii, with Eggman Nega unlocked by beating him in Long Jump Plus on the fourth day of Mario's story in the Road to Rio mode. Toads, Orbot, Cubot and a Chao appear as referees in this event. In the Road to Rio mode, Long Jump appears as the event on day 4 of Mario's story. In this event, the player has three attempts to jump, with the longest of the three being their final score for the event. The player must start by pressing the A Button repeatedly to cause their character to accelerate and run up to jump line, though they will lose speed if they stop pressing before the line. As they approach the line, the player must press the B Button once when they are as close to line as possible to take off. The player will be given a rating based on how close they were to the line immediately after their jump, and once the character's jump has been completed, the player will be given the exact distance, in centimetres, that they jumped before the line. Pressing the button after the character has crossed the line or failing to press at all will result in the character being given a foul and no distance will be recorded for that jump. As the character is jumping, a green ring will appear in the air, and if the player presses the X Button while their character jumps through it, they will be able to perform a Super Dash. If the X Button is pressed with perfect timing, the character will perform a unique animation and gain a lot of distance, whereas if they only press it with good timing the character will just gain a yellow glow and will not jump as far. Once the character lands, their distance will be given, based on their running speed, how far from the line they jumped, and whether and how well they performed a Super Dash. You can narrow your takeoff distance all the way down to 0cm. See how close you can get to the line. While in the air, press the X Button close to the ring to perform a Super Dash. Press just before the ring to get more distance. This page was last edited on March 4, 2019, at 00:35.